It’s fall for fun and learning at Brightwater Center’s third annual Ecotober celebration, featuring a variety of free activities the whole family can enjoy. 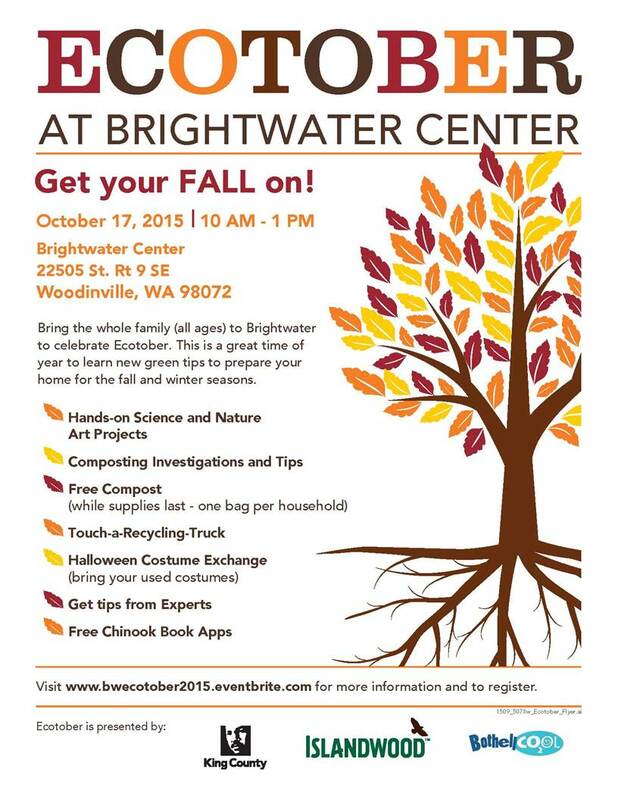 Ecotober takes place on Saturday, Oct. 17, from 10 a.m. to 1 p.m. at Brightwater Center, 22505 State Route 9 S.E. i n Woodinville. Hear live music, get expert tips to prepare your home for fall and winter, learn about composting and get free compost samples (while supplies last), and take part in a Halloween costume exchange. Kids can Touch-a-Recycling-Truck and explore nature and science through hands-on art projects. Pre-registration is available online at Eventbrite. Ecotober is sponsored by King County Wastewater Treatment Division, IslandWood, and Bothell Cool. Additional partners include Friends of the Hidden River, Nature Vision, Buy Nothing Bothell and King Conservation District. For additional information or to request reasonable accommodations for people with disabilities, please contact Kristin Covey at 206-263-9412 or 711 TTY Relay. People can also learn more about Brightwater Center online at http://www.kingcounty.gov/brightwatercenter.